From right to left, Mary Kopf, Ray Limoges, Michael Skeps, and Jon and Martha Lindenberg are all members of the 100 Club and actively hike and bike on a weekly basis. 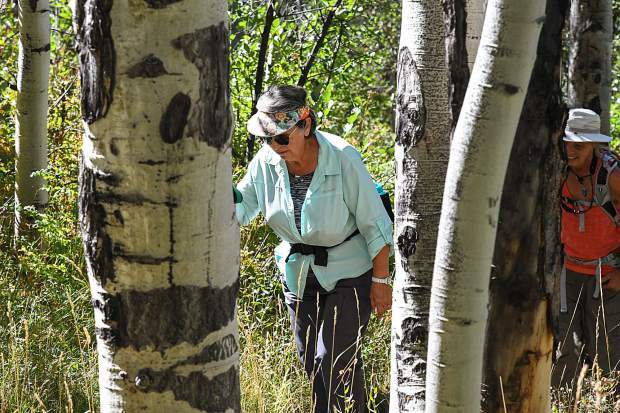 The Wednesday Wanderers walk through the aspen trees during a hike near Hunter Creek in Aspen on Aug. 29. 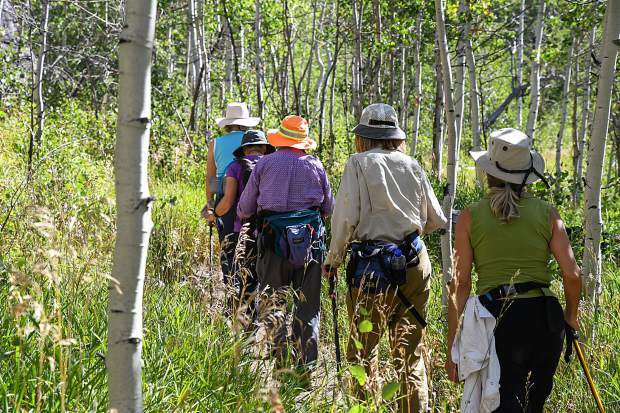 The Wednesday Wanderers head out on their hike to Hunter Creek in Aspen on Aug 29. Alice Ramsay smiles and enjoys the nice weather during a hike to Hunter Creek in Aspen on Aug. 29. 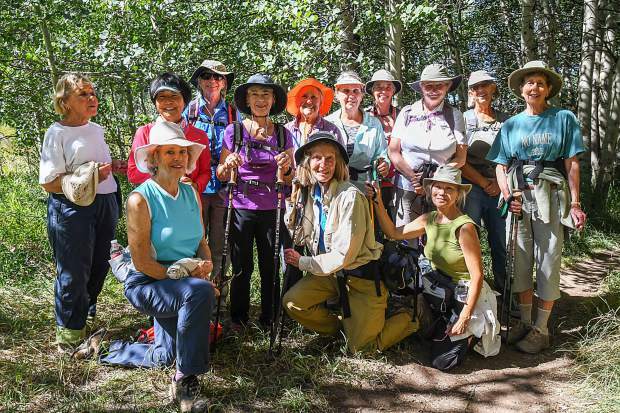 The Wednesday Wanderers started 43 years ago when four active women, Ginny Morris, Gwen Porter, Marion Piper and Jane Lee, started a weekly hiking group. Now the group ranges in age from 50-85 and consists of over 80 women. 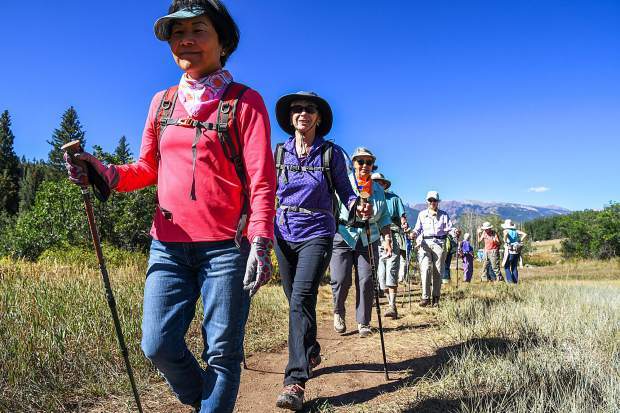 Sally Mehalek directs other members of the Wednesday Wanderers group during their hike to Hunter Creek in Aspen on Aug. 29. Each Sunday through Sept. 23, the Post Independent will also be featuring a series of “Super Seniors” profiles, as nominated by our readers earlier this summer. Look for the next installment on Sunday, Sept. 9. 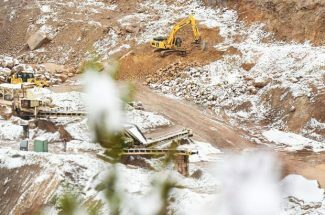 Editor’s note: This is the second installment in a four-part Longevity Project series by the Glenwood Springs Post Independent looking at the keys to living a long life and issues around aging in Garfield County. Additional parts will appear each Wednesday through Sept. 19. Garfield County’s seniors are an active lot — and it’s not just walking to the supermarket or playing bridge. 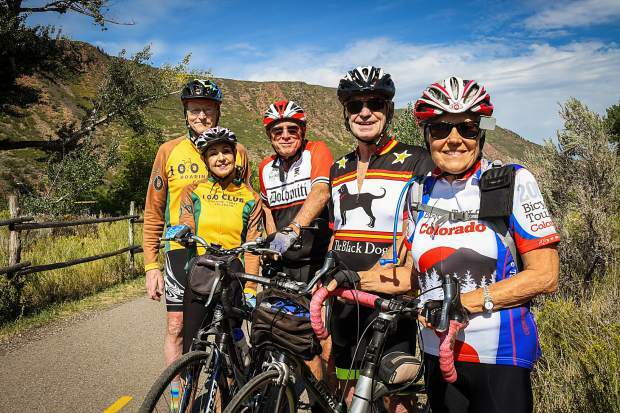 Colorado ranks second in the nation in physical activity by people over age 65, and Garfield County’s forever youngsters are contributing to that impressive ranking. Hal Sundin, 92, long-time member of the skiing, hiking and biking “100 Club,” will finish out this hiking season clocking over 100 miles. 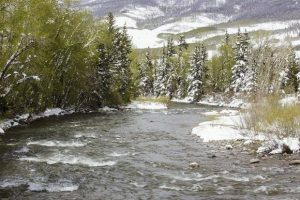 Sundin, who has climbed all of Colorado’s 14ers (14,000-foot peaks), leads the club’s hiking group with a total 7,200 miles. “That’s farther than from the Equator to the North Pole,” he points out. 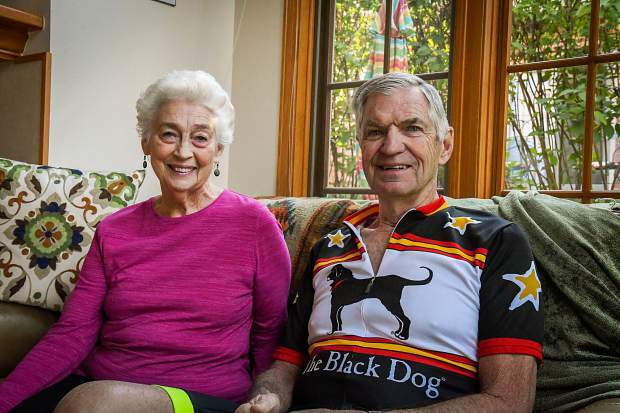 Limoges and his fellow cyclists go everywhere — Grand Junction, New Castle and Zion. And even with last year being such a bad snow year, Limoges still got in 75 days of skiing. 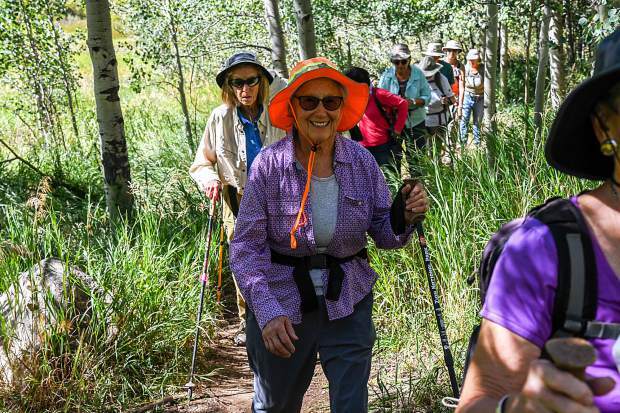 “I bet it’s jumpin’ on 48, 49 years that I’ve been hiking with the group,” says Kay Robinson, 85, of Rifle. These hearty ladies remain undaunted, even at the challenging high altitudes of the central Rocky Mountains. 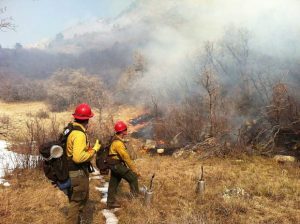 “About a month ago, we were all hiking at altitude, and I passed out,” recalls Wanderer Viola Robinson, 83. “We were way up at the top of Independence Pass at Lincoln Lake – 12,000 feet. Over a large tumbler of cold pomegranate juice, sister Wanderer Joan Troth, 86, proclaims, “I’m a health nut. I eat steamed, organic vegetables, quinoa, poached farm fresh eggs and I drink pomegranate juice.” Troth even feeds her Labradoodle, Cocoa, local grass-fed beef. In 2017, Garfield County was the first community to receive the Governor’s Healthy Community Award. The county was selected for its focus on disease prevention through healthy eating and active living. The county’s expanding bike and pedestrian infrastructure was recognized. Barbara Peterson and Debby Sutherland of Garfield County Senior Services coordinate free balance and exercise programs for seniors throughout the county. Seniors are joining the gym in record numbers. From Rifle to Carbondale, enrollment is up. Battlement Mesa’s Grand Valley Recreation Center has overall membership of 2,543, and 370 of those members are over age 65. The center’s fitness instructor, Charla McCredie, holds low impact versions of cardio and strength classes. McCredie has seen a significant rise in her senior attendance. “I started the class about a year and a half ago, and for the first six months it was one or two of us,” she said. “And in the past year, it has really grown to 15 to 18 a class. And for Battlement Mesa, that’s amazing. 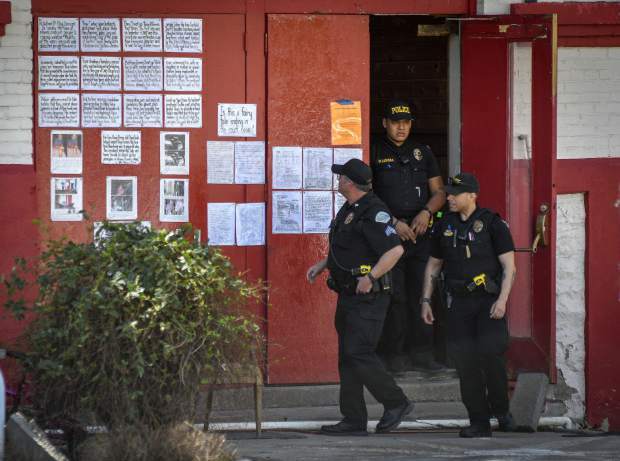 Over in Rifle, Tami Sours, who manages the Senior Center, has seen an enthusiastic attendance. In Carbondale, “Seniors Matter” instructor John Norton has taught fitness for over 15 years. “Once people pass the age of 60 or 70, they think they don’t have to keep trying anymore,” says 100 clubber Shirley Limoges, 80.